So a few things happened last week. I moved into a new apartment, I saw Girls live at Bowery Ballroom, and I learned that Aviva makes the best bloody marys I have ever had in my life. Two out of those 3 things will be semi-captured in this post. 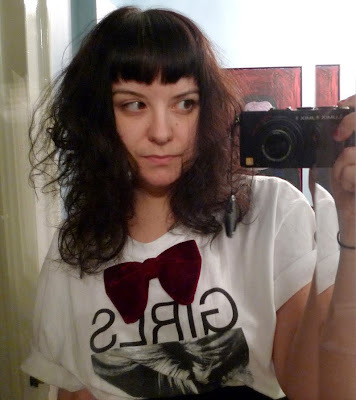 Girls tee (I couldn't resist, I have wanted one desperately since I saw Marisa's this summer! OBSESSED WITH IT) I was gonna croptopify this jazz, but i just wor it tucked in. I don't think it will escape my scissors of fury though. It is sorta imminent. 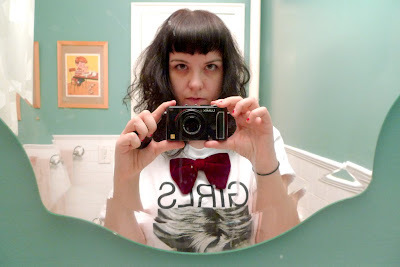 Also pictured: Vintage velvet bowtie (kinda wanna start wearing them on tees like this) , new bathroom. Question: How do we feel about bringing back a witchy striped sock? It is verrrrry 8th grade (that is, ME in 8th grade) but it felt like the only correct leg option for such an outfit. It's also very "Ricky's Halloween costume" but...I like them right now! Sowwy. I swear to Gaga, my eyeballs are totes regs when I am looking straight ahead. That right one just goes rogue when I look to the side. So hot, I know. i've been thinking about digging out my b&w striped socks as well. i say go for it! After reading your last two posts - it's official - you are my imaginary girlfriend. i wore striped socks to like every grade 8 gym class. I am ALL FOR the striped socks. And the color of your bathroom walls! I have to start getting used to your camera in this new mirror. I'm really into to witch stocking, somebody needs to bring back that look and that somebody is you. I think I'm going to make official crop tops for my movie club inspired by the movie FUBAR. It won't be until next year, but it will be awesome.